Welcome to Bonny Borders, a gardening maintenance service which cares for your garden at an affordable price. 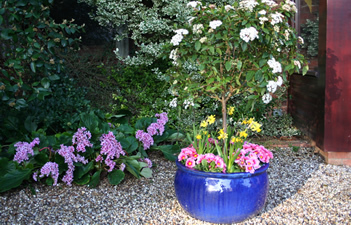 Ceinwen, who provides this service, aims to create a beautiful and manageable garden, small or large. Having an interest in design and a love of nature, she will maintain and improve your garden in the style you prefer. Regular maintenance visits can be arranged with you at a reasonable hourly rate aswell as one-off visits. Ceinwen has public liability insurance for your peace of mind. Ceinwen can also provide planting ideas and planting plans as required to improve the look of your garden, by suggesting the addition of plants in borders or pots and containers so as to provide colour and seasonal interest. 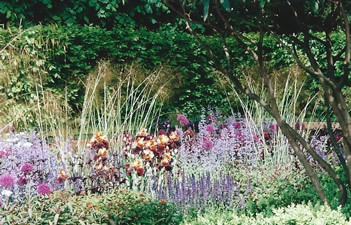 Ceinwen's clients have found her diligent, friendly and sympathetic to their garden requirements. Areas covered include: Colchester, Ardleigh, Nayland, Dedham, Great Horkesley, Copford, Mersea Island, Wivenhoe, Elmstead Market. "I was knocked out by the subtle and 'sympathetic' gardening feat you performed today." POTS and CONTAINERS planted up to bring seasonal interest e.g. with flowers or Herbs. 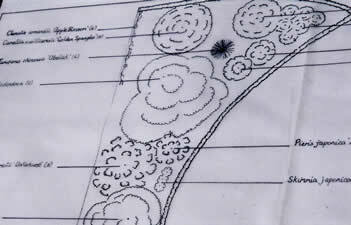 PLANTING PLANS and creating new borders. Bonny Borders operates within approximately an 8 mile radius of Colchester, Essex, although some jobs will be considered outside this area. © 2019 Bonny Borders, Colchester Essex - All Rights Reserved.